BEST OF 2014: #5-1 + EXCLUSIVE INTERVIEW WITH #1’S DIRECTOR! Adored by critics, audiences and general movie-goers alike, Wes Anderson’s latest tale of flight and fancy is an immensely enjoyable film that deserves all the praise it’s been getting. The film is also fortunate to boast a fantastic comical performance by Ralph Fiennes, playing one of the year’s breakout characters M. Gustave H, a man who despite signs of ego and flamboyance is still content with what little he has and savours every moment of his existence and his job. It’s hard to not find yourself liking him by film’s end, and though other high-profile cast members like Bill Murray, Jeff Goldblum and future Bond girl Léa Seydoux, are not given as much room to shine Fiennes just owns every single scene he’s in. Anderson cynics won’t be swayed by this film, but for everyone else The Grand Budapest Hotel – our pick for the Most Stylish Film of the Year – is a booking worth making. As you may have already guessed, Film Feeder doesn’t tend to review or even see many horror films, and with this year’s lacking attempts – Annabelle, Ouija, The Pyramid et al – it looked like it would stay that way. And then, The Babadook came almost out of thin air to give new hope to the genre that hadn’t been there in years. An ingenious psychological horror from debuting filmmaker Jennifer Kent, the simple tale of a mother and son being haunted by a character from a children’s book may sound like a tired premise, but the way it’s approached and the themes and ideas it tackles is mind-blowing in just how smart it is. It’s established early on that the mother – an astonishing performance by Essie Davis – is already in a warped and disturbed mind frame thanks to her obnoxious and hyperactive child, the death of her husband years earlier, and struggling overall in her job and fitting in with society. So when the Babadook eventually comes-a-knockin’ (or does he? ), we’re left to question whether the “monster” is real or just a disturbing result of a nervous breakdown. The themes of motherhood, mental illness and self-acceptance all play a huge role in the genuinely terrifying actions that occur later one, and you’re left flabbergasted that a horror film in the 21st century actually relied on true horror instead of cheap jump scares. More than anyone, 2014 belonged to the directing duo of Phil Lord and Chris Miller, with their films The LEGO Movie and 22 Jump Street not only making serious box office bank – $468m and $331m worldwide respectively – but winning over even the most cynical of critics and audiences, including us here at Film Feeder. Out of both, The LEGO Movie is our favourite just for the joy and passion being put into building (pun intended) such a creative and expansive universe. With memorable and lovable characters, stunning animation, great moral lessons for children and adults, and a genuine sense of heart – especially during a late third-act twist that has everything making sense in the most inspired reveal of the year – it quickly rose in the ranks of classic family films. Yes, we’re predicting that this will have as much staying power as Toy Story, The Iron Giant and other smart animated films over time because of what it is and what it sets out to be. However, that’s not to keep 22 Jump Street out of the loop either. A film that had no real reason to exist outside of making money nor did it look like it was going to even live up to what the first film had to offer, Lord and Miller surprised everyone yet again with a sequel that openly mocks the fact that it’s a cash-grabbing sequel, same plot and everything (all leading to one of the funniest and incredibly satirical end-credits gags of the year). But even then, the film still holds together strong on its own, thanks to the winning chemistry between Jonah Hill and Channing “My Name Is Jeff” Tatum and the endless supply of fresh comedy. For Phil Lord and Chris Miller – who, with The Lego Movie and 22 Jump Street, have crafted the (Joint) Best Comedies of the Year – everything was, indeed, awesome. Well, it had to feature SOMEWHERE on a 2014 top 10 list, and for a very good reason. Richard Linklater’s 12-year epic could so easily have been just a gimmick and not much else, but once again the surprises came thick and fast when it becomes apparent that Linklater and his cast – from Ethan Hawke to Patricia Arquette to the titular boy himself Ellar Coltrane – have also been making something that has genuine heart, pure emotion and strong character building over all these years. Watching Coltrane evolve from a wide-eyed six-year-old to a bearded young adult on his way to college is magical in its own right, but just as fascinating is seeing how everyone else grows up along the way. If you find yourself not interested in the main character, there’s Hawke and Arquette to root for as the two divorced parents who find themselves on very different paths, or even older sister Lorelei Linklater (daughter of the director) who matures in her own way. The filming, spread across many years, highlights various points in recent history such as Obama’s 2008 election, a Harry Potter book launch, the rise of Facebook and so on, making for an excellent time capsule for historians while also never neglecting poignant and personal times for any young person growing up like fascination with certain subjects, first loves, camping trips et cetera. It’s a film unlike any other, one that everyone who’s ever grown up around this time period or any time period will instantly relate to, and one that proves how family bonds – unlike our bodies – never ages. Richard Linklater deserves prime recognition for this ambitious project, which we’re naming the Best Film of the Year, for its timely yet timeless exploration of life and childhood. As crazy as it may seem to some of you that we picked writer-director John Michael McDonagh’s Calvary for the #1 spot over something like Boyhood, it just so happens to be the film we preferred overall. With Brendan Gleeson in a career-best performance as a troubled priest struggling to make peace with a very hostile community after having his life threatened in a confessional booth, the film is astonishing in its complex portrayal of the priesthood as the world sees it today; Gleeson’s Father James is a rare beacon of light in a sect rocked by endless abuse scandals over the years, and everyone else’s aggressive nature can be explained by how they judge what a person stands for, rather than the person themselves. Since we see that Father James is a kind-hearted, if imperfect, human being it makes his treatment by others because of his religion all the more saddening. It shows two sides of the coin that is Catholicism, and what they stand for when the whole world is against you. The supporting characters, horrific though some of them may be, are still very memorable thanks to a well-written script and an abundance of performances by their various actors; Dylan Moran’s wealthy banker endlessly uses his riches as a source of power over everything else, while Game of Thrones’ Aidan Gillan as an atheist doctor haunts you with a late story involving a child and an unfortunate supply of euthanasia. The whole film is as if the Coen Brothers directed an episode of Father Ted, and that’s high praise considering the quality of both. It is unapologetic in how it handles edgy material such as this, but endlessly finds ways to make you laugh, cry, be invested and have you think about what it all means in today’s society. It’s our Favourite Film of the Year because it’s the only film of the year that reminds us that no matter what you may believe in, we’re all still human underneath. 1) Firstly, congratulations on having Calvary be Film Feeder’s top film of 2014! What does it mean to you to have this film provoke such a positive response from audiences? I was expecting Calvary to be a much more divisive film than it’s actually turned out to be. Audiences and critics alike seem to have really responded to a film that is exploring very difficult spiritual and philosophical issues, and that’s very satisfying. I guess it’s a unique film, given the current climate. 2) What were the origins of this particular story, and how did you come about the themes and character arcs in the writing process? The starting point was the intention to write about “a good man” and have it not be ironic but completely sincere. This led to the creation of the priest character. I then structured the narrative around the five stages of grief. “Character arcs” are the result of the story you want to tell. 3) Did you have any influences that you referred back to as you were fine-tuning the film? Not when I was fine-tuning the film, no, as that would’ve been too late in the process. During the writing of the screenplay, and during pre-production, my influences were Bergman’s Winter Light, Carlos Reygadas’ Silent Light, Ulu Grosbard’s True Confessions, Hitchcock’s I Confess, Bruno Dumont’s Hadewijch, Dreyer’s The Passion of Joan of Arc, the policiers of Melville, the complete works of Robert Bresson, and the paintings of Andrew Wyeth. 4) This is your second collaboration with Brendan Gleeson after The Guard, how instrumental was he in developing the central character of Father James? I sent Brendan the first draft of the screenplay and he responded with notes. I don’t think the character of Father James changed that much, but we expanded on the relationship between Father James and Fiona, his daughter, to make the film more emotional. 5) The film also features a strong supporting cast, made up of notable Irish faces and established character actors. What do you feel they individually brought to their performances that enhanced the underlying themes of the film? I don’t think an actor’s performance can enhance the “underlying themes” as that’s all there in the dialogue. An actor’s job is to create a character, preferably a memorable one, and this cast did that, all across the board. 6) Patrick Cassidy contributes something haunting but beautiful with his score, as does Larry Smith with his cinematography. Both lend the film a strong visual and aural identity, but how do you feel they helped enhanced your particular vision? Patrick Cassidy’s score brought a level of emotion that we needed as, without it, the film might’ve been dismissed as being too coolly intellectual. Larry Smith’s widescreen cinematography ensured that we would not be perceived as a small, parochial, “Irish” film, but as a big, confident, grandiose movie dealing with universal themes. 7) You and a few associates — former Working Title executive Chris Clark, Oscar-nominated filmmaker Flora Fernandez Marengo, and successful entrepreneur Elizabeth Eves — have also set up production company Reprisal Films, which dedicates itself to creating “original, idiosyncratic films.” What excites you the most about thinking outside the box when creating content based on this company dedication? The most exciting part of the process is the realisation that the movies we want to make aren’t even going to be attempted by the major studios or by the majority of the players in the independent sector. 8) 2014 has been a very strong year for Irish cinema, with other projects such as Frank, Jimmy’s Hall and Run & Jump also leaving strong impressions on audiences and critics alike. In your opinion, should there be more attention given to the clear talent emerging in this particular industry than there is already? No, not really. There should be more attention given to the cinema of South Korea. 9) To what extent may we ask what future projects you have lined up in the future, as potential follow-ups to Calvary? I hope to be shooting my first US project in March next year. It’s a black comedy about two corrupt cops called War on Everyone. 10) Finally, as we arrive at the end of the year, what would you say your particular favourite films have been in 2014, and why do you think they left such an impression on you as a filmmaker as well as a fanatic of the craft? My favourite films so far this year have been Blue Ruin, Ida, L’il Quinquin, The Past, The Berlin File, Enemy, Under the Skin, The Raid 2, Starred Up, Stranger by the Lake, Blue Caprice, Beyond Outrage and Edge of Tomorrow. They all have something within them — a shot, a scene, a character, a point of view — that is worth stealing. 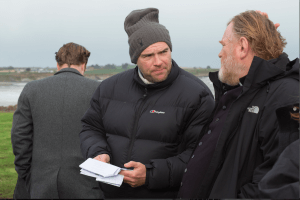 Many thanks to Lizzie Eves at Reprisal Films for enabling this interview to happen, and of course to John Michael McDonagh for taking the time to answer our questions in the first place. That just about wraps up our countdown of Film Feeder’s top and bottom 15 films of the year 2014! If you’re curious about our worst, feel free to check out #15-11 here, then move on to #10-6 here, and finally #5-1 here!